Side flexing extending conveyor systems - online prices - take your pick! 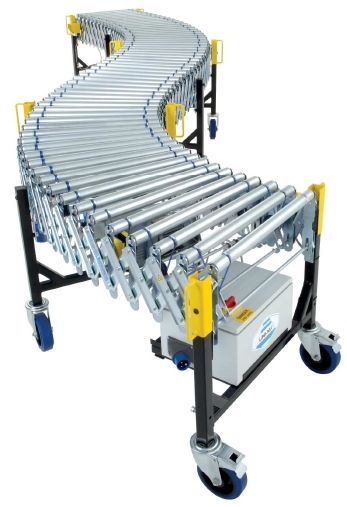 With prices from only £237, Automation Supplies Ltd bring the widest range of quality yet economical flexible conveyors. Live online prices competitively pitched against other UK flexible conveyor manufacturers or suppliers and with fast delivery. With 100's of options based on different models, designs of rollers in gravity and even powered versions manufactured to high specifications and supplied to you on time, we now offer all our flexible conveyor systems on a worldwide basis. 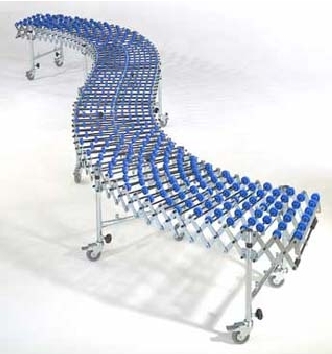 These flexible conveyor designs are extremely popular. Our flexible roller conveyors and expanding skatewheel conveyor systems are very adaptable and can greatly help your temporary or permanent flexible conveying needs. From skatewheel and full width roller models right up to specially designed longer models with connecting hooks, heavy duty gravity and powered roller conveyor versions, our expertise and experience will find the right conveying product for the job you need to do and help you pay less in the process. Our delivery times are short and you can be assured of receiving quality equipment with the peace of mind given by a full warranty from a respected manufacturer. If you are not sure which way to go with your project, we are only a phone call away with experienced, plain talking advice that's free, non technical and friendly. Typical Standard Length - Compacted to Expanded. Other options available, the above are for illustration. See the pricechecker logo to check out our prices.